Finnish cellist Samuli Peltonen (b. 1981) has pursued a rising career ever since he won the first International Krzysztof Penderecki Cello Competition in Kraków, Poland, in 2008. 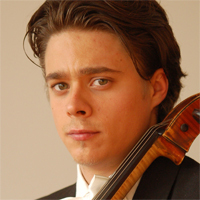 In 2006, he won the national Turku Cello Competition and joined the cello section of the Helsinki Philharmonic Orchestra, which has accompanied him in a number of soloist performances. Samuli Peltonen has appeared with major Finnish orchestras and given solo and chamber music recitals throughout Europe and in China. He is completing his studies with Arto Noras at the Sibelius Academy in Helsinki and has further taken part in masterclasses given by Fred Sherry, Torleif Thedéen, Tsuyoshi Tsutsumi, Martti Rousi, Marko Ylönen, and Franz Helmersson. Samuli Peltonen plays a cello made by Giovanni Grancino in 1698, kindly lent to him by the Pohjola Bank Art Foundation.